A late-month Adventure April report. On the home front, everyone that attended my three speed ride on Sunday April 2nd fulfilled four out of five of the sub-challenges, everything except the overnight. In New Jersey, Robert has gotten in a couple rides as well. Out in Denmark, Jeremy has gotten in the unpaved challenge plus the distance challenge. Alright, hope everyone is having fun out there. Let’s see those reports! Hey all! We are gearing up for Pedalpalooza, Portland’s annual celebration of Bike Fun. This year, it’s all of June! Of course I am planning all sorts of fun stuff for the month, but as like the past umpteen Pedalpaloozas, a three speed ride will happen! Coincidentally, this ride will happen right at the same time as the Woodlawn Park Coffee Outside, which starts at 9 am. So come with your coffee or tea brewing setup. (You’re going to use it again during the ride, anyways!) Some food ain’t a bad idea. Yes, this ride is on the same day as Sunday Parkways-North. No, it is not happening after that, but (somewhat) during it. After dwindling attendance for my June ride the past couple years, I feel that now is the time to mix it up, and do it earlier so we can do a longer ride. There may be time after the ride to catch some Parkways action (and who knows, maybe we’ll even ride part of it?) But fear not, there are several Sunday Parkways to choose from this year! And this is the one “open class” Three Speed Ride I do every year. Meaning: this ride is open to ALL BIKES, not just three speeds. Of course, three speeds are preferred, but don’t sneer at someone for showing up with derailleurs! The ride itself will be about 15 miles total. As always, there’s a bit of “rough stuff”, meaning dirt paths and maybe even push-bike action. Three speeds are capable steeds, you don’t have to be so gingerly with them! Somewhere towards the middle-to-end will be the tea stop. Get out your stoves and kettles! And yes, a snack is advisable. Ride is not a loop, but will end near transit. Directions back to the start gladly given. But if you stick around, we’ll most likely go someplace where we can get food and drink after the ride! Okay, hope you can join us! And please let me know if you have any questions. 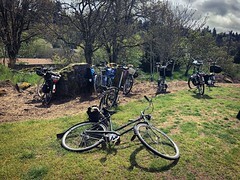 Finally, the Three Speed Ride Report for the April 2 ride! We had a good turnout too, around 15 (we picked up a couple more at the end of the ride.) And the ride itself was just the right mix of ease and challenge, with an overall length of 18 miles. Some folks remarked that this was as far as they pushed their three speeds, which was a good sign. But you can push them even further than this ride! This was the first Three Speed Ride so far to leave Portland! 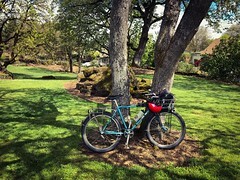 Yes, we passed through the tiny enclave of Maywood Park on the I-205 path. They are definitely getting a lot of work done on Gateway Green, but it’s not open yet. 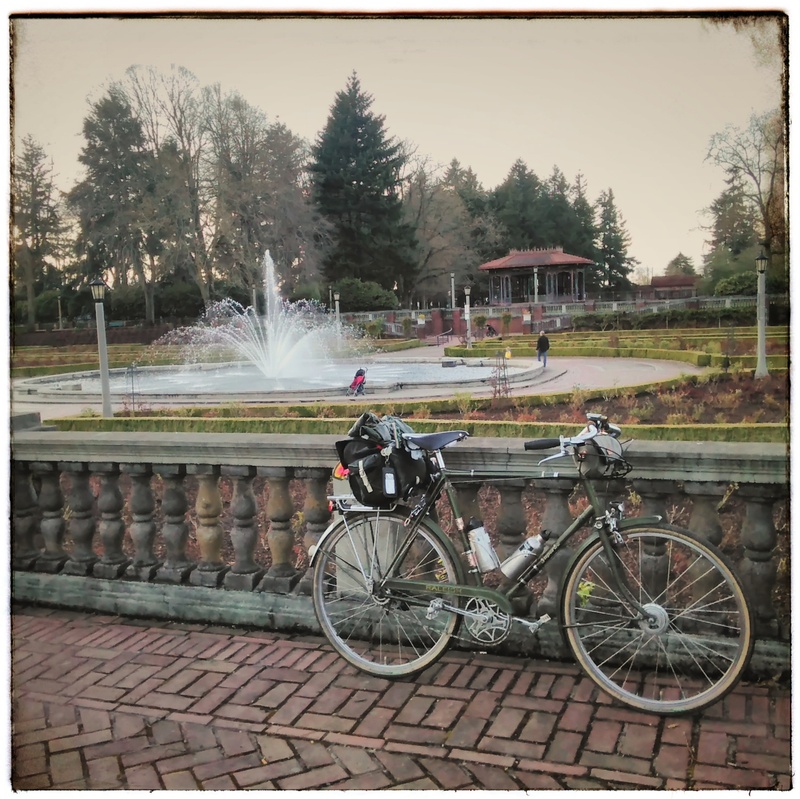 Half of the ride was spent east of I-205. The little bit of “dirt track” through John Luby Park was fun. As was the pump track at Ventura Park. Bet you have never seen a dozen or so three-speeders ride a pump track before, eh? 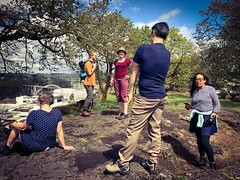 And to get the climbing challenge in, we climbed the side of Tabor. We lost a few people here, but regained them down the hill. Here is the route of the ride. And that’s a wrap! 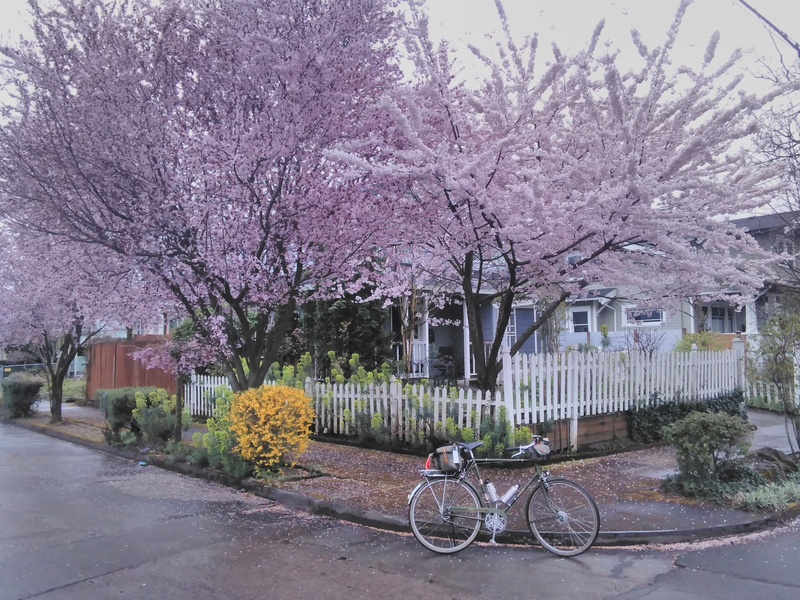 See you for the next ride sometime during Pedalpalooza in June! Please remember that the bike doesn’t have to be a three speed! As with the previous challenge, I accept four or five speed internally geared hubs, basically, what you could have gotten from Sturmey-Archer in the 1970’s. As for that pesky derailleur on Bromptons, you’ll need to disable the derailleur to participate in the challenge. Note: I just said “disable”. You don’t have to remove the derailleur itself, just make it unworkable. For Challenge 1, the “distance” challenge, you don’t necessarily need to use “digital means” to computate distance. You can estimate old-school style via paper map, or if you got one of those old-school clicky-click bike odometers, you can use that as well! Because I revised Challenge 2, the “climb” challenge a couple times (and making it easier each time!) I screwed up on the cumulative climbing number. You just need to climb 100 feet, or 30 metres. Some editions said 45 metres, because originally I had it at 150 feet and forgot to change the metrics. So, just 100 feet or 30 metres of climbing! And regarding Challenge 5, the Bike Overnight: The prohibition on staying at friends or family applies to both indoors and outdoors lodging. So you can’t crash on Aunt Betsy’s couch four miles down the road, nor camp in her backyard. The lodging or camping spot needs to be (theoretically) paid for. Also regarding the Bike Overnight: I should have mentioned this before, but you can use public transit to augment your ride! You can use a bus or train to get you out to a more distant spot and ride from there. The ride would still need to be at least three miles one way, and you would still need to carry all of your stuff on your bike after you get off the bus. So hopefully this clarification might open up more possibilities for some of you folks, especially if you live in a big urban area like Chicago. Okay! And honestly, I am trying to make this challenge hit the ride balance between too easy and too hard. I’m not purposely making Byzantine rules for the sake of making Byzantine rules, I just wanted to lay everything out. And since this is the first year, I won’t know how well everything will work until April is done. If you have any questions or comments regarding all this, please get in touch. Otherwise, get out on your three (or four, or five) speed and ride!